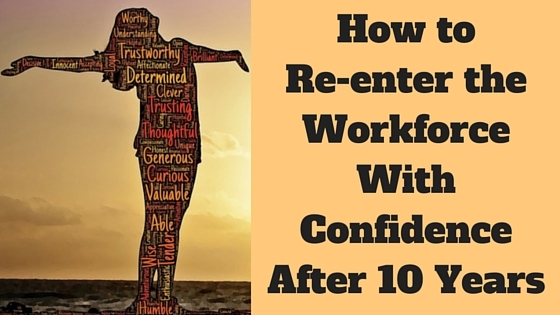 What is it like to re-enter the workforce after 5, 10 or even 15 years? Are you scared, excited, worried, lacking confidence, stuck or unsure where to begin? These might be some of the feelings you are experiencing when thinking about returning to the workforce after a significant time away. However, if you take a look at what you’ve been doing while you’ve been off work and take an inventory of the skills you’ve learned, you’ll be able to re-enter the workforce with confidence no matter how long you’ve been away. It’s important to first identify what you were doing during your time away from traditional work. Were you looking after a parent or an in-law? Or were you raising a family? Or maybe you took a sabbatical. Whatever the reason, it is valuable to include this information in your resume as it will account for any time gaps. When looking for candidates to hire, human resources executive Roberta Fidalgo said that she is looking for someone with transferable skills and the willingness to learn. Next, I recommend doing a skills inventory. So what exactly does that mean? It means taking a full inventory of what you have done during your time out of the workforce. People often discount valuable experience they have gained while doing other things that are not considered traditional “work”. Here’s an example: my client Donna* was asked to consult on what colours the church she attended should be repainted. Donna had an eye for colour and design and was a great asset when the church decided to redecorate. These are transferable skills that can be used in a new career like interior design. Bobby*, another client and stay-at-home mom, has volunteered to do catering events at her church. She purchased food and beverages, organized volunteers, ensured the food was prepared according to health standards and arranged the food in a pleasing manner – all skills that could be used in event planning, catering, restaurant management or maybe running a business. Work does not need to be paid to be valuable to employers. People often discount the value of doing volunteer work or community service. Employers want to see volunteering on a resume. Why? It shows that you want to give back to the community, as well as that you have been developing skills while away from “traditional paid work.” Again, the skills you have learned here can be invaluable in getting your next job. Just think of that time you organized a parent-teacher fundraiser or your child’s After Grad. There are some great skills here that you can contribute to your next job. Now that you have done an inventory of your skills it will be helpful to look at how they might transfer into your next job. Whether you are doing a career transition into something completely different or returning to an old job, every skill acts as a stepping stone towards your new job. Let’s take a look at the example again of Bobby*, who has been homeschooling her three sons for over 10 years. Any thoughts on what some of her skills may be? Well, Bobby deals with whining and grumpy children almost daily. She also encourages them to learn new things and uses different methods to appeal to their learning style. And on a regular basis they do art, math and social studies. So how does that transfer into skills for the workforce? Check it out! There are many more skills that come out of homeschooling but these are just a few to get you thinking. Now you may be wondering how you can uncover all those great skills you’ve learned and gathered during your time off. Working with a career coach can help you identify those transferable skills and more. A career coach offers you an unbiased perspective, and can really draw out those experiences, personal qualities and attributes that make you unique and valuable to an employer. A career coach will provide structure, help you increase your confidence and set up a plan to re-enter the workforce in a position that you love! Thinking of hiring a career coach to help you re-enter the workforce? Connect with Mary Kruger, browse our directory of career coaches and get a FREE consultation or request a personalized coach recommendation!